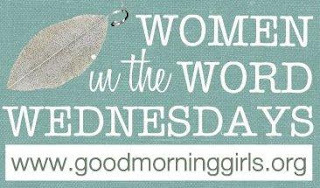 Sometime in summer I came across www.goodmorninggirls.com and I was amazed at this community of women that come together here and study God’s Word. So I decided to try it. I told some of my extended family members about it, and right now it’s 3 of us doing the study on the book of 1 John. I’ve been doing a lot of in-depth Bible studies by Beth Moore, Priscilla Shirer, Mary Kassian, Kelly Minter, just to name a few. But I never done a study of a book of the Bible where I study it verse by verse. It’s a whole new perspective that I get by just concentrating on that one or two verses. And the accountability that it requires really appealed to me. Let’s be honest: who wants to get up earlier as needed to spend time to meditate on a few verses of the Bible? I really have had a hard time with it so far. I’ve done my Bible studies over my lunch break or in the evening. But the morning??? Really??? I have a hard time as it is to get up in the morning. But I must tell you that it makes a big difference to start the day with God’s word and prayer compared to not to do it. I’ve seen an improvement in my attitude, I’ve seen my day go a lot smoother just because I’ve got some verses of 1 John in the back of my mind that remind me just in the right moment to do this or not to do that. So, if you’re not in any Bible study, why not give it a try? You can join my accountability group if you’d like to. We could use some more members. Or you can form your own group. And you can do it from the comfort of your own home. The only thing you’ll need is the study guide that’s offered on the website and an Internet connection to send me an email that you’ve done it. Thank you to the wonderful women at Good Morning Girls for setting up this study! I am totally not a morning person, but I’ve discovered the same thing. My day is so much smoother when I start off in the word – even if I’m still rubbing my eyes through half of it!